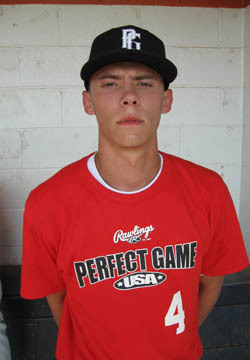 Logan Thomas is a 2010 SS/RHP with a 6'0'', 170 lb. frame from Liberty, SC who attends Pickens HS. Lean athletic frame, long arms, wiry strength. Relaxed hitter, simple short swing, very good bat speed, has gap power, ball jumps, good looking swing. Solid infield actions, arm strength, quick clean transfers, fields out front. Also pitched, heavy 88 mph FB, throws easy, big FB movement, hard CB spin with 2 plane bite, could end up as high level pitching prospect.